Ginseng has potent antioxidant and anti-inflammatory properties and is known for improving exercise performance, regulating hormones, and enhancing mental alertness. 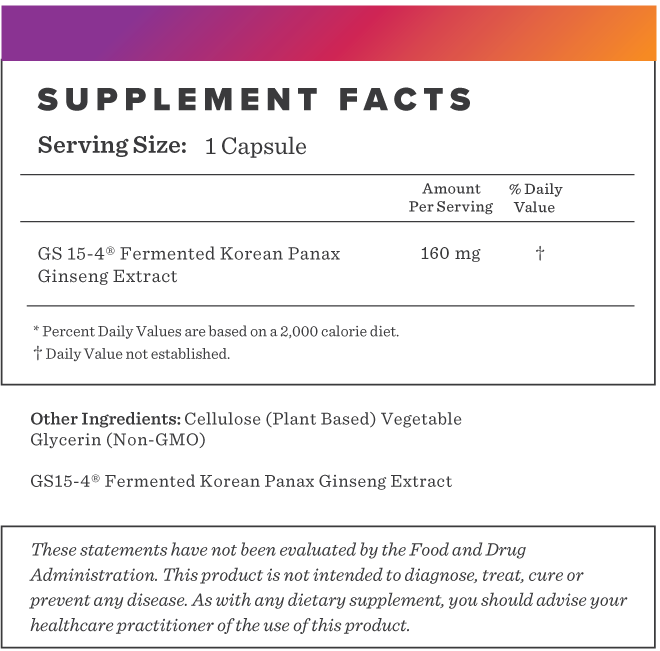 Enzyme Fermented Korean Panax Ginseng is a highly bioavailable form of ginseng known as "the world''s most powerful adaptogen." It''s invigorating and adaptogenic properties can help boost the body and brain while also enhancing a healthy stress response. Enzyme Fermented Ginseng may help provide an improvement in energy while supporting mental clarity and overall mood. It also may help stimulate nerve cells and support the body during stress. 1. Lee S, Rhee DK. Effects of ginseng on stress-related depression, anxiety, and the hypothalamic-pituitary-adrenal axis. J Ginseng Res. 2017;41(4):589-594. 3. Reay JL, Kennedy DO, Scholey AB. Single doses of Panax ginseng (G115) reduce blood glucose levels and improve cognitive performance during sustained mental activity. J Psychopharmacol (Oxford). 2005;19(4):357-65. 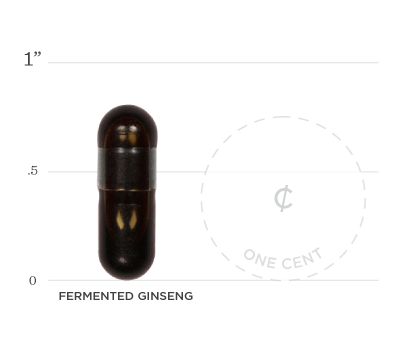 Below we've broken down the main functions of our Fermented Ginseng and the benefits it can provide. Research shows that ginseng is effective at regulating hormonal changes caused by stress and works to prevent both anxiety and depression (1). In animal studies, the effectiveness of ginseng has been compared to that of the popular anti-depressant, Prozac. Ginseng has been shown to be a promising treatment for muscle fatigue (1). One study concluded that compared to placebos, ginseng was more effective at improving physical performance. A double-blind, placebo-controlled, balanced crossover designed study showed 200 mg of Panax ginseng significantly improved cognitive performance and significantly reduced mental fatigue. The results suggest supplementation may improve mental performance, mental fatigue and even blood sugar markers. While the exact mechanism is unknown, the authors suggest benefits may be from the acute gluco-regulatory properties of the extract.